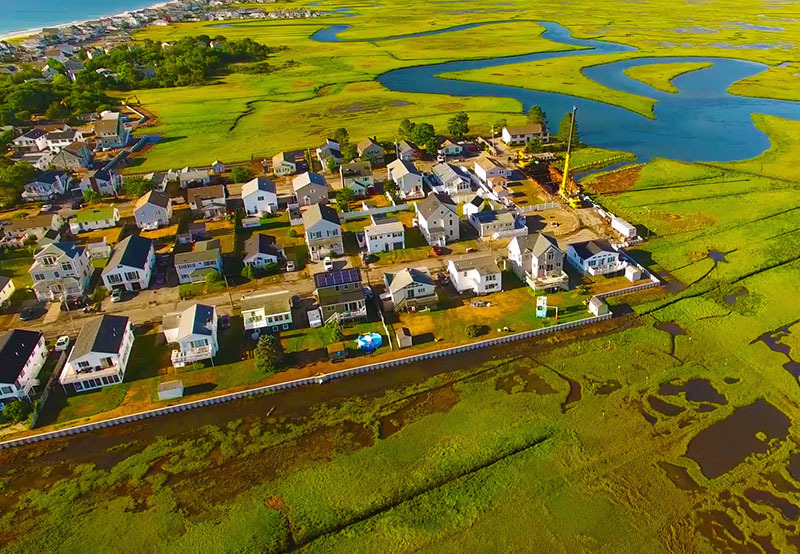 Charter successfully constructed flood protection structures for a residential neighborhood located along the Blackwater River estuary in Salisbury, MA. 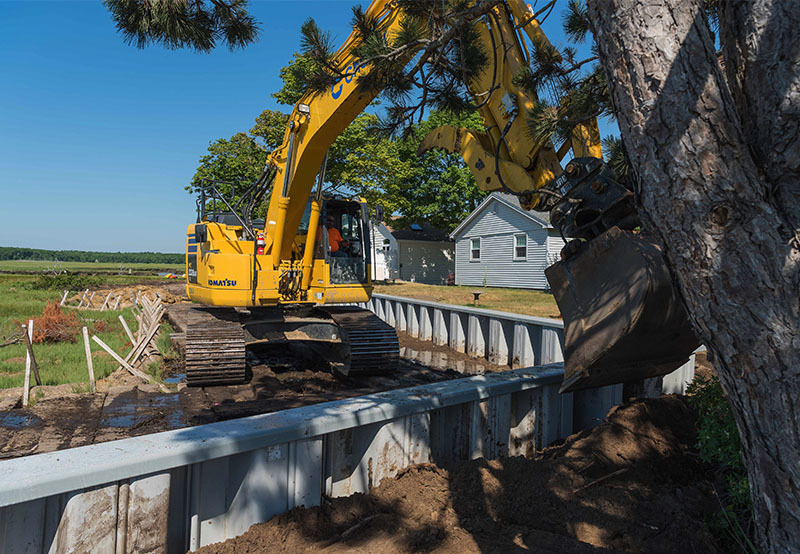 This beachside neighborhood was severely impacted by regular monthly flooding, which resulted from the installation of a bridge across Route 286 in Seabrook, NH. The bridge – which replaced an older, dilapidated bridge – widened the river banks creating excess flow, and an increased risk of flooding. Regular flooding impacted 135 residences adjacent to the Blackwater River. 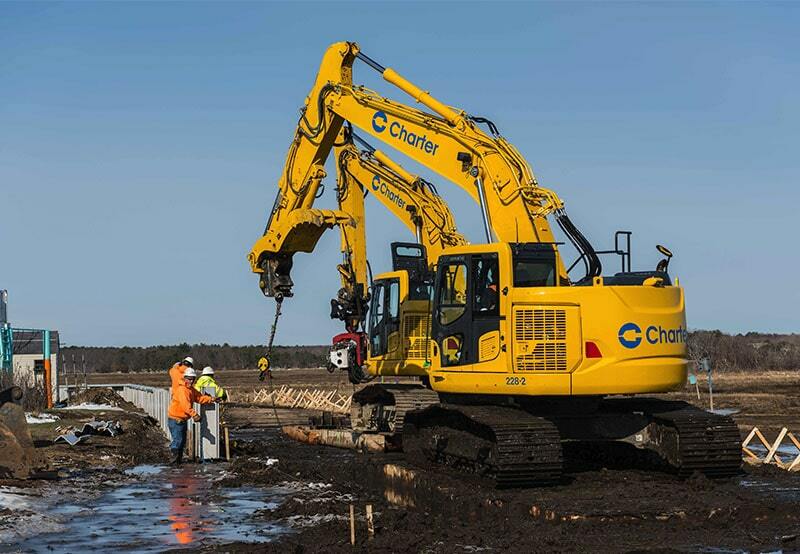 Charter crews installed nearly 41,000 SF of vinyl sheet pile to create a flood protection wall within a salt marsh and across resident’s backyards. 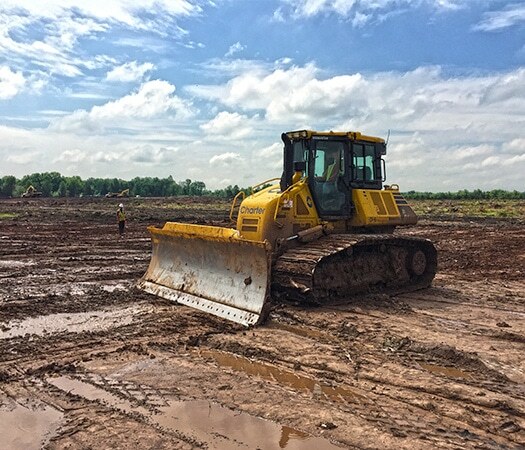 Restricted work areas, environmental controls related to working in a coastal marsh, and the location of the work in a residential neighborhood required Charter’s crews to work within constraints that restricted its operation. 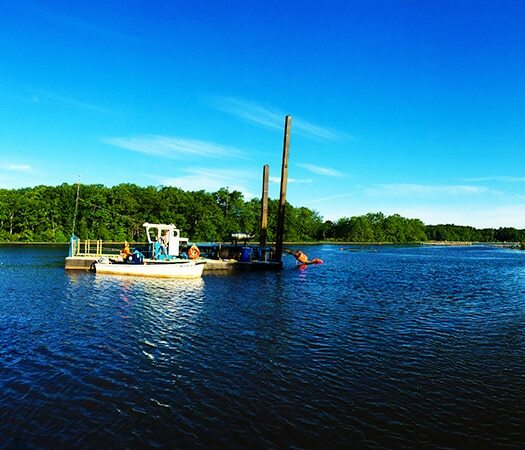 To protect the sensitive salt marsh during vinyl sheet pile installation, the crew laid out approximately 800 LF of 12” timber mats which acted as a platform. 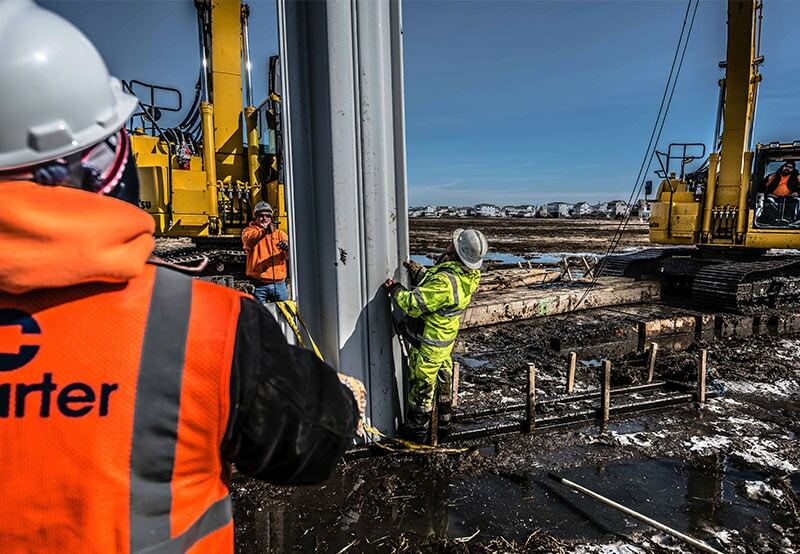 Timber mats were stacked in order to work in the dry while competing with flood conditions. 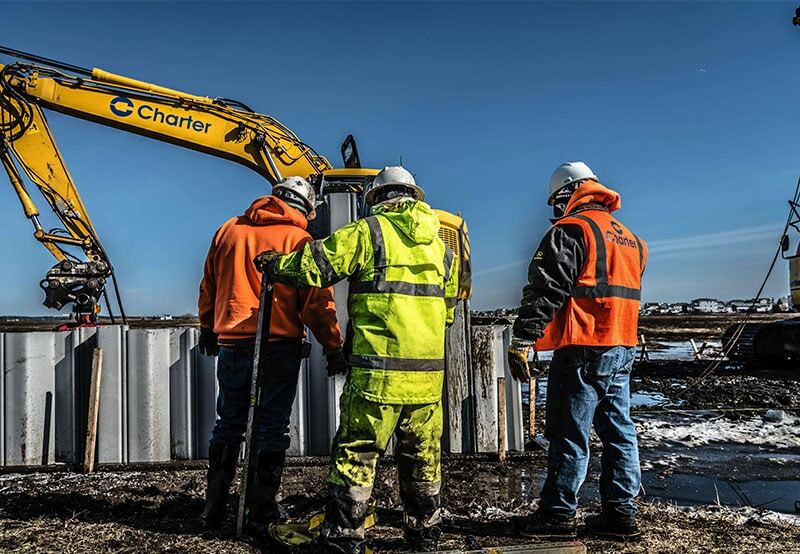 Despite these conditions and obstructions ranging from rocks to telephone poles, Charter installed upwards of 1,000 sf of vinyl sheet pile wall and 100 LF of fiberglass cap per day. Charter additionally implemented speed limits and street sweeping operations to avoid adverse impact on the neighbors. Regular community outreach was performed to ensure residents were informed of upcoming activities that could impact their lives. 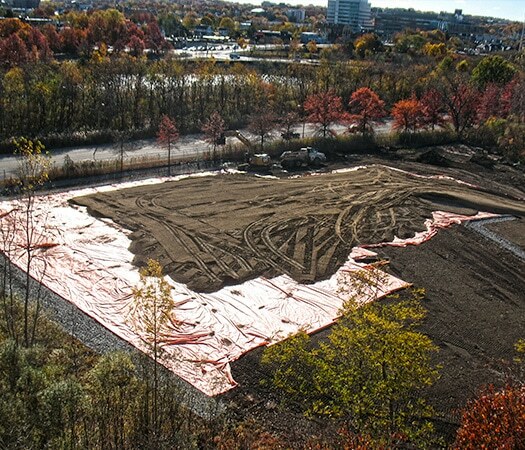 Charter successfully constructed flood protection features for a residential neighborhood located along the Blackwater River estuary in Salisbury, MA where roadways were flooding 1-2 times per month.